How about that? No 90 degree days in the two week forecast! We are very excited; hopefully some of the smoke will blow out of here soon. It’s going to be a couple weeks until our next round of carrots are ready. Our early spring beds cleared out a little slower than planned. But, !fear not!, more delicious Lower Valley Farm carrots are in your future! We seeded 5 100’ beds five weeks ago and another 5 beds two weeks ago. 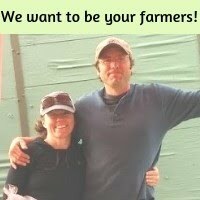 So, once we have carrots back in the rotation we look forward to putting them in your CSA box every single week for the rest of the season. We pulled this years shallots on Monday. They are hanging out in the shade to dry and cure. We will start including them in the shares after they are fully cured. The garlic is fully cured and this coming week we will sort through it. First we will set aside the garlic that is used for next year’s ‘seed’. The garlic heads will be broken apart in late October and planted. Each clove will make one head for next year. After we set aside the seed garlic we divvy the rest of the garlic up for CSA. We are anticipating that we won’t have extra garlic for sale this year. We are excited to put it all into our CSA and set aside a generous amount for seed so we can grow even more garlic next year; because we know how much you all love garlic. We love it too; it really is ~so~ good. In a few weeks we will pull this years storage onions and start curing them. Storage onions are something we will have LOTS of this year; they are so huge and beautiful. Speaking of beautiful, how about this week’s broccoli! Pretty amazing to grow big beautiful broccoli when it’s been so hot out. and if those don’t sound good there this article by The Kitchn is FULL of awesome broccoli ideas. In skillet saute a pound of ground pork, when mostly cooked add, diced green onions, zucchini, and bell peppers, while that sautes whisk up a dozen eggs, put eggs in a casserole dish. Chop and add basil to skillet, cook about a minute more. Pour skillet stuff into casserole, top with Parmesan and bake until cooked through about 40 min at 350. Hey guys, summer gets busy. Let me tell you where guilt doesn’t belong. Guilt doesn’t belong with the blessing of nourishment that is food. Too busy to cook? 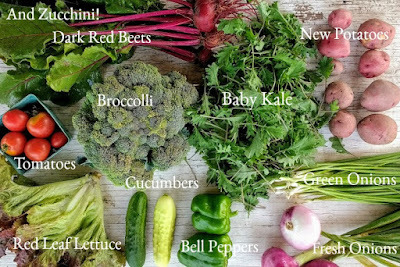 Have a CSA share and want to use up some veggies? Why not lightly saute some green onions, bell peppers, thinly sliced zucchini and put them on top of a frozen pizza. When blinging out a frozen pizza this way you’ll need to add some oil to your basil and cover it with more cheese so the basil doesn’t get burnt.